Ben Reilly: Scarlet Spider Vol. 5: Deal with the Devil Review – AiPT! Will Sliney’s art in the exciting first half make this worth a look. Peter David has written a very unique take on Spider-Man — or in this case, the clones of Spider-Man. He’s taken one of the most reviled, yet nostalgic aspects of the Spider-Man mythos and given these clones something to do in Las Vegas. In this final fifth trade paperback, David and artists Will Sliney and Bruno Oliveira wrap things up, but is it good? For months, an occult group called the Diogenes Initiative has been resurrecting heroes and letting them run amok in Ben Reilly’s town. As the Scarlet Spider, he may have a thing or two to say about that. Plus: It’s Ben and Kaine vs. a pack of ravenous hellhounds as madness descends on Las Vegas! But can Kaine and Ben keep themselves from each other’s throats long enough to save the city?! If you wanted a conclusion, you get it here. For the longest time, the Spider-Man clones have been attempting to save a little girl’s life and heal the issues between them. David wraps things up more or less nicely here. Ben Reilly vs. Sauron, who ya got?! The first four issues of this collection are drawn by Sliney who brings his hyper-realistic look to the series. He’s always been a favorite of mine due to the great physiology and musculature of the characters. In these scenes, he gets to draw major mutant characters (Sauron!) and even entities from another realm. Sliney has a great handle of character expressions, particularly for comedic effect. Even with Scarlet Spider’s mask on you can see his shock or in another scene Ben Reilly’s stupified face as he explains to a taxi driver he totally didn’t see another guy in the car nor did he teleport into the taxi either. Speaking of Sliney’s portion of the book, this might be the best part story wise. David mixes in surprises, answers to his overarching angels vs. demons plot, and even wraps in a comical fight sequence. If this series has done one thing right it’s how it’s given Ben Reilly and the Scarlet Spider unique perspectives and voices. They’re both a bit rough around the edges — one is even willing to shoot people, but you get a sense there’s still good there. David has basically explored varying levels of morality in these Peter Parker copies. Even though the sickness of the little girl has lingered for what seems like ages, it does get a definitive ending here. The last few issues collected here rush to get things wrapped up. The last few issues aren’t so great. The art is a stark contrast to Sliney’s work and that contrast takes you out of the narrative. We even talked about this very thing on the AiPT! Comics Podcast this week. Bruno Oliveira’s work isn’t bad by any means — it just doesn’t fit following the clean look Sliney brought to it. The plotting is awkward and seems rushed too. David has Mephisto show up to bring this character’s meddling into the picture, but it’s so forced it’s not natural or entertaining. You’ll be twiddling your thumbs waiting for this section to be over. Then on top of all that, there’s some character assassination on the last few pages. 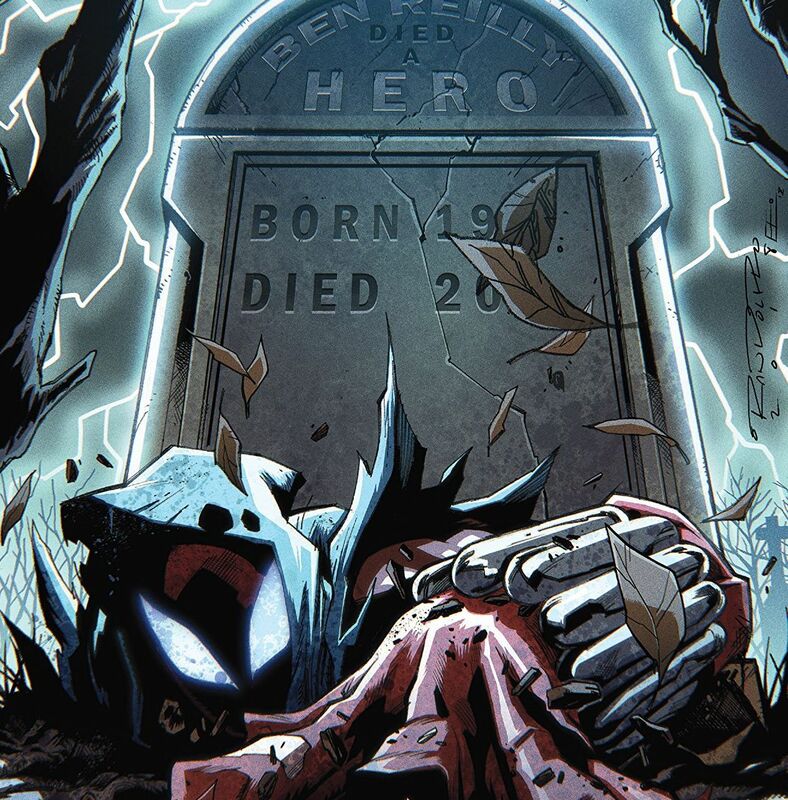 I won’t spoil it, but there seems to have been great work done to fix the Scarlet Spider and Ben Reilly relationship. To end the book on this note is unfair to the characters. I highly recommend reading the first half of this book thanks to Sliney’s art and David mixing things up with comical action focused ideas and twists. It’s too bad the book ends the way it does and it’s not only forced, but rushed too. I highly recommend reading the first half of this book thanks to Sliney’s art and David mixing things up with comical action focused ideas and twists. It’s too bad the book ends the way it does as it’s not only forced, but rushed too.